Last week, after a chat with myself about basil and desserts, the idea for a strawberry maple basil-ey breakfast stuck in my head. 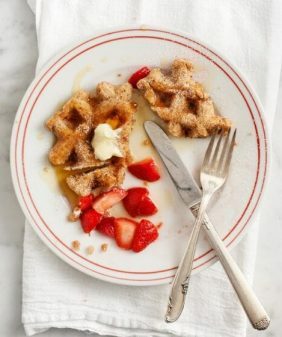 In a small bowl, mix and gently mash the strawberries with a little drizzle of maple syrup. Add the chopped basil. Set aside. Whisk the eggs and almond milk together. Dip bread slices in the egg mixture and stack slices on a plate to let the liquid soak in for a few minutes. 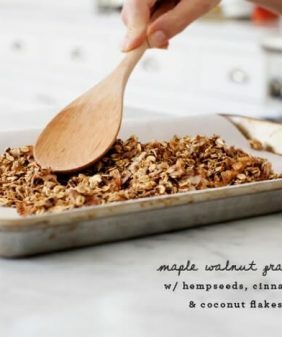 Heat the coconut oil in a large skillet over medium-low heat and cook slices on each side until golden brown. Top with the strawberry mixture and serve with more maple syrup on the side. 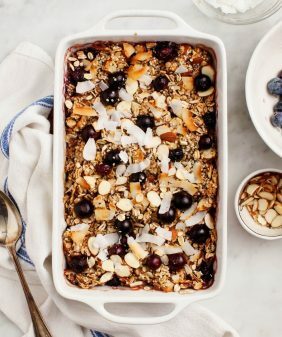 Definitely making a vegan version this weekend! I’ve been wanting to do something with the abundance of strawberries lately! 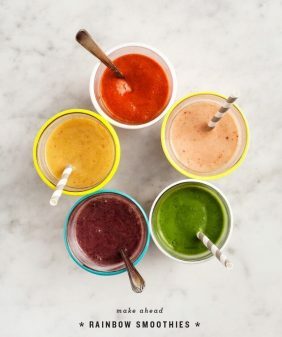 I say, ‘everything in moderation!’ This sounds amazing. And thank you for the link to my waffles! Have a wonderful weekend! I’m a sucker for strawberry anything, and who doesn’t love french toast? YUM! This is such a neat combination! I love it! Fantastic post as always 🙂 Happy weekend! Jeanine! I want your kitchen!!! 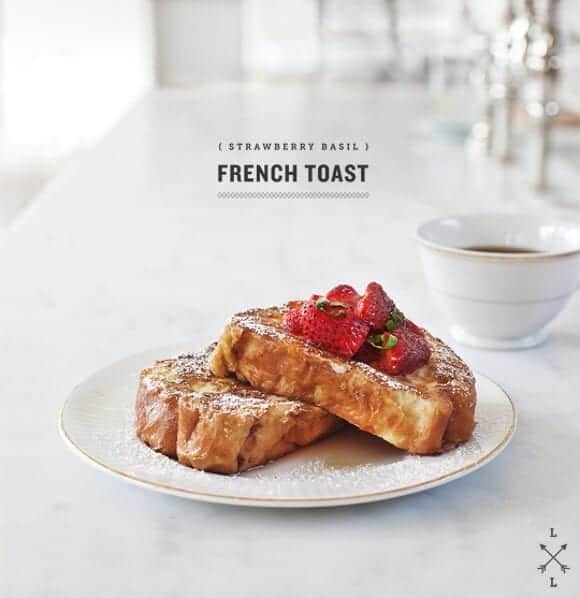 I also want this strawberry basil French toast. Putting green herbs in sweet things is something I’m embarrassed to say I haven’t experimented with yet. It looks like I’m going to have to make some more French toast this week…in the interest of science. I love how you introduce interesting flavor combinations in unusual ways. I’m particularly intrigued by the strawberry basil scones! 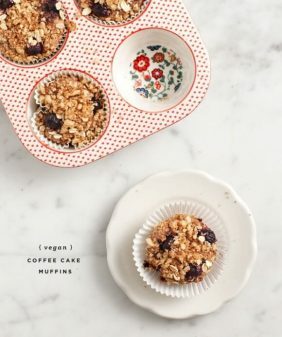 This is the *perfect* follow up to your sushi – everyone needs a little indulgence every once in a while and this sounds and looks wonderful. I love strawberries and basil. In fact they are the stars of my next post. But I’ve never had them on french toast, so this looks new and delightfully inviting! It’s a good combo in ice cream, so why not French toast? Lovely idea. Fabulous! 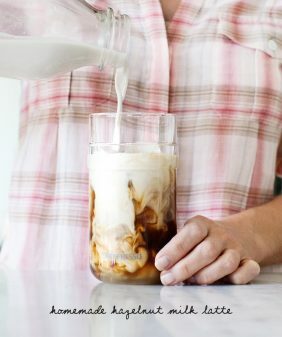 I can’t wait until the weekend so I can make this! i’m never eat toast when breakfast but when i was try this recipe. I think i love idea for make the french toast for the favorite menus. Deli :), but I have doubt with coconut oil. Is it good for cooking? I’ve read that it is not good for high temperatures.